Dry, Steam Upholstered & Leather Sofa Cleaning Greenwich SE | Quality Property Care Ltd. The reliable professional sofa cleaning company will make your furniture look new. Your sofa and upholstered furniture are the places where you, your pets, friends, family and guests probably spend most of the time when you are at home. This means that all the hairs, crumbs, dead skin cells, dust, dirt and spills go right on top and into the upholstery. To remove all disgusting and harmful stuff from your furniture, call Quality Property Care Ltd. which offers professional sofa and upholstery cleaning services in Greenwich SE and the area. The professional upholstery or sofa cleaning company provides the best sofa cleaning prices for residential and commercial upholstery cleaning. The professional sofa and upholstery cleaning company Quality Property Care Ltd. has been offering its high quality, reliable services since (2005) and is a preferred cleaning service both for the domestic and commercial upholstery cleaning needs of the residents of Greenwich SE. The stain removal and deep cleaning provided is done by dry or wet cleaning, depending on the type of material and stain being cleaned. Apart from the upholstery cleaning, the cleaners can do blinds cleaning, curtain cleaning, drapery cleaning, bed beg mattress and mattress cleaning treatment as well. All cleaners are competent and trained to deal with any kind of stains and materials safely for you and for your furniture. There are materials like sued that do not take too well to steam and high pressures, they are far too easily damaged and can be quite tricky to properly clean. This is why we use a dry cleaning agent which we apply utilizing a fine brush to imbed it into the fibers of the upholstery. Before this is done, however, the entire sofa is cleaned with a hoover to remove any hairs and solids from the stained area. It allows raises up the fibers making them more receptive to the detergent, ultimately causing less stress to the materials and the cleaners. If needed the stain is pre-treated with a special agent which helps it dissolve the material and separate it from the fibers of your couch. Depending on the stain it might have to set for 10 minutes or so, this allows it to react properly and eliminate any artificial pigmentation and colouring that might stain the fibers even further. Once set we use a high power vacuum device to extract the detergent, the stain and the filth around and leave no trace aside from clean upholstery. There is no drying required and the detergent that we have used is fully removed so the sofa is ready to be used as is, without any chance of colour bleeding or moisture transfer to your clothes. Make sure you do everything possible to keep your classy upholstery in a top condition! 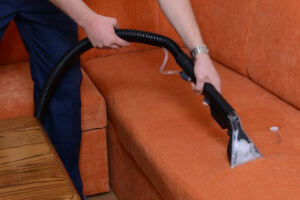 Rely on our trustworthy upholstery cleaning company in Greenwich SE! Make an order right away! Call us on 020 3746 4287 and get a free quote today!